When Betty’s husband died 13 years ago, she took over the restaurant they ran together. She decided to expand and added a shop selling woven bags. 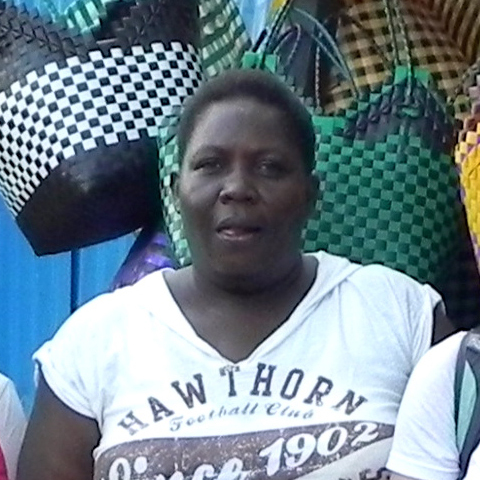 Now on her 3rd loan, Betty uses the money to expand her products to include bicycle seats, sandals made from recycled tires, and metal trunks. Once the 3rd loan is repaid, she plans to use a 4th loan to expand the interior of her shop, as well as to add more products. Now Betty supports her four children and two nieces. Betty now has 3 successful businesses! Kisumu sits on the northernmost bay of Lake Victoria – the primary source of tilapia for Europe. A number of processing plants in the area fillet the fish and prepare them for shipping. 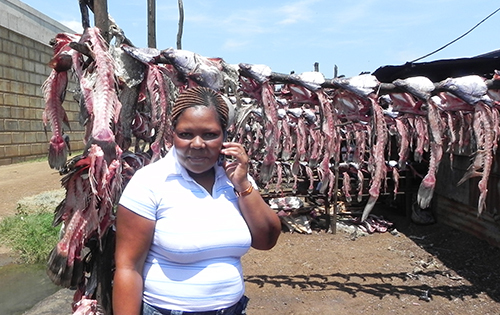 Members of the Kasarani Women’s Group process and sell what’s ‘left’ of the fish. Fish heads and bones are fried and taken to markets around Kisumu. Scales are removed from the fish skin and sold for fertilizer. And the skin itself is used in manufacturing shoes and belts. Each of these women say that their lives have been improved by being able to grow their businesses, collaborate with each other, and make money to pay their children’s school fees. Miriam is a member of the Kasarani Women’s Group who all collaborate on running a single business. After her husband’s death, Jennifer was poorly treated by his family. With her four children, she went back to live with her mother and sister. With her first loan, Jennifer bought corn, boiled it, and then sold it in the market. 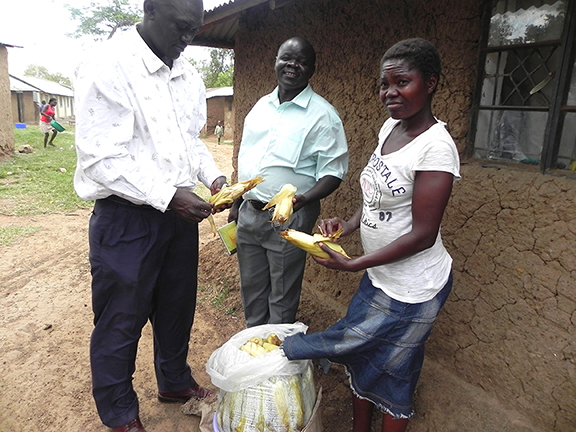 Now on her third loan, she has provided funds that allow her mother to also buy corn to boil and sell. Together, Jennifer and her mother support eleven people in their household. As a marginalized young widow, Jennifer had low self-esteem and little hope. 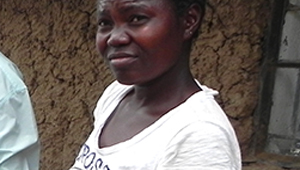 Through her participation in the micro finance program, she is now confident in her ability to provide for her family. Jennifer is the Treasurer of the Obunga Women’s Group. This group has become far more than just micro finance accountability. They now meet a second time each week to share their lives and to support each other. They have even begun donating to a welfare ‘kitty’ so that they can help each other when a need arises. 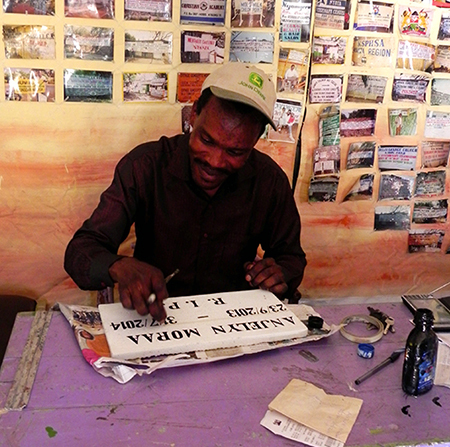 An artist who wanted to put his talents to work to support his family, Johnson has a sign shop called Nyamgero Signs. He used his first loan to expand his range of supplies so that he can show customers that he has what is needed to produce their projects. He has recently submitted an application for his second loan, in order to continue growing his business offerings. Johnson’s wife works with him in his business. Johnson used his first loan to buy supplies for his sign shop.